Masculinity is a difficult concept to define, especially with the way traditional gender roles have shifted and transformed through the latter half of the 20th century. Typically, it refers to the possession of male characteristics and qualities, such as physical strength or aggression. It might also be associated with ideas of leadership, virility and assertiveness. Since femininity is sometimes seen as submissive or dependant, masculine modes will often strive to be dominant of others, through force or violence; or to be independent and even isolated from society. This essay will examine the focus of women in the films Terminator 2: Judgment Day (Cameron 1991) and Beauty and the Beast (Trousdale/Wise 1991), and how they are represented in the struggle between two modes of masculinity. 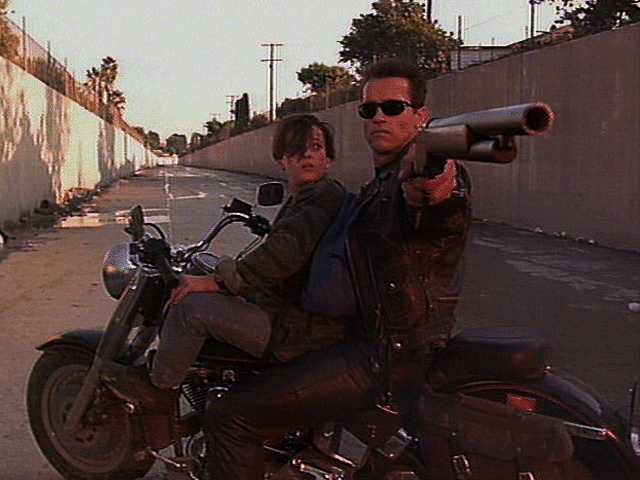 Terminator 2 centres on the highly masculinised Sarah Connor, and how she contends with the technologized masculinity of the two cyborg assassins that hunt and protect her. Beauty and the Beast centres on the highly feminised Belle, and the two versions of masculinity—the dashing Gaston and the brooding Beast—who wish to possess and control her. Each character will be explored in detail, concentrating on how their gender is represented and evolved throughout each film. Terminator 2 is a film brimming with masculine aggression. The two cyborg assassins are not only built in the forms of men, but confront each other through corporal violence and the exchange of [absurdly phallic] weapon fire. The two machines—the T-800 (Arnold Schwarzenegger) and the T-1000 (Robert Patrick)—are cold, determined, and at the peak of physical prowess. They are idealised visions male strength, and represent a retreat from perceived feminine traits of fragility, dependence and nurturing. They are men transformed into weapons—soldiers wrought of steel—unwavering in the completion of their objective, and unbridled by human morality or vice. It could be argued, however, that such a retreat from feminine traits is also a retreat from human ones, and that an idealised masculine mode must also contain elements of femininity. Indeed, the character arc of the T-800 focuses on his ability to care about and comfort John Connor, and to become something of a father figure to the boy. Meanwhile, his opponent, the T-1000, becomes more and more obsessed with the evisceration of John, and thus comes to resemble less and less a figure of humanity. Sarah Connor (Linda Hamilton) represents the sole female protagonist of the film, and yet she is as far from a feminine archetype as one could possibly get. From the brief visions we see of her in flashbacks, we know that Sarah was once a soft-featured and nurturing mother, but the knowledge of humanities imminent destruction has hardened her psyche. In the years since John’s childhood, she has become increasingly less stable. Imprisoned in a mental institution for the past few years, Sarah has transformed her body into a weapon. Like the machine that hunted her, Sarah is now muscled, calculating, and proficient with firearms and hand-to-hand combat. She has come to embody the same physical and psychological tension of the terminator’s form. She rejects her femininity as a weakness, wearing sun-glasses as a filter through which she and the world might interact, and embracing the destructive power of technology that was once used against her. She eventually undertakes her own termination mission, targeting Miles Dyson, the creator of Skynet; just as Skynet targeted her (the mother of its enemy) in the previous film. Through her fear of these technological monsters, Sarah has come to emulate them, as a rejection of her own femininity. However, this transformation is also a rejection of maternity, as she can no longer display any affection towards her son, John. Like the T-800, she sees him merely as a subject to be guarded, and scolds him for trying to save her. Ironically, though, the figure she has modelled her new masculine form after (the T-800), becomes more maternal throughout the film. The fact that Sarah fails to terminate Dyson, followed by “her tearful reconciliation with John”, can be “seen as a re-establish[ing] of conservative social” norms (Gaine). She feels sorry for her target, something a terminator could never do, and thus reverts back to a “maternal role”. This change is symbolised by the removal of her sunglasses, taking away the artificial filter through which a predator might scrutinise its prey. Sarah has met the threshold at which she can no longer retreat from female, or indeed human, empathy. However, this reading is simplistic, since “Sarah remains the leader of her guerrilla force, giving orders to John, the [T-800] and Dyson” (Gaine). She has not reverted back to a gender stereotype; so much as she has evolved into a kind of warrior-mother, integrating the “two personae without contradiction or tension” (Gaine). Sarah’s acceptance of her maternal traits is not a consignment to female submission, but rather a rejection of her technologisation, which, “with the masculinity associated with muscles and guns, is also a masculinisation”. She has realised that “technologised masculinity leads to alienation and dehumanisation”, and that perhaps the way to prevent this future is not through killing, but through “empathetic engagement with others and a transcendence of technology” (Gaine). While Sarah develops into this technologised form and back again, the T-800 has undergone a parallel humanisation. He reaches a similar realisation, telling John that “it is in your nature to destroy yourselves”. His empathy develops to a point where he is willing to sacrifice himself, so that his violence will not contaminate the human fate. The antagonist of the film, the T-1000, while male in form, and equally as aggressive as the T-800, represents a far more fluid interpretation of gender. His ability to liquefy, change shape and even imitate other people, makes him a “post-biological state” of being (Huyssen). The amorphous, and even androgynous, nature of his body makes him more menacing, since he has no clear shape or definitive form. Even refering to the T-1000 as a “he” seems disingenuous, since it can morph into women and even inanimate objects. He takes the form of a male police officer for most of the film, probably since that role in society will afford him a high level of authority and access, but his true biology resembles more of a metallic liquid. The T-1000 is a combination of human fluidity and mechanical relentlessness, expressing a true threat to humanities role. He constitutes a technological fantasy of “creation without a mother” (Huyssen); that genderless technology has superseded humanity. While Sarah and the T-800 represent a drive towards technologised masculinity, before developing a humanised empathy, the T-1000 represents a post-biological, post-gender being. Beauty and the Beast presents two competing modes of masculinity – the charismatic, dashing, and arrogant Gaston; and the brooding, alienated and ferocious Beast. Both men vie for the affections of Belle, the titular Beauty, though neither loves her (at least in the beginning); rather they want to possess her. Gaston, the self-styled village hero, encompasses all of the qualities of masculinity. He is handsome, muscular, charismatic, and selects Belle “to be his bride-to-be using virtually no other criteria but her appearance” (Wynn). Furthermore, when Belle rejects his chauvinistic advances, he resorts to violence to obtain and suppress her. The Beast is presented in quite a different facet of masculinity. He is indeed strong and aggressive, but much more alienated and menacing. He desires Belle not for her beauty, but to break the spell cast upon him. While the Beast is visibly more unsightly than Gaston’s suave demeanour, he proves himself to be a gentler, kinder soul. As stated, neither man loves Belle for who she really is, but rather they demand obedience from her, for their own selfish intent. Belle herself is indeed beautiful, but she is also kind and intelligent and an independent thinker. The Beast slowly comes to realise this, and he develops a genuine adoration for her. Gaston, on the other, hand is enraged by her lack of obedience, and evolves from a narcissistic, yet harmless buffoon, into a murderous brute. Gaston is a caricature of the ideal male; all brawn and no brain. The film is making fun of the traditional fairy-tale hero, instead occupying Belle’s affections with the dangerous, yet emotionally wounded Beast, which ironically has become the new masculine archetype in series like Twilight and True Blood. Belle is certainly not masculine in the way a heroine like Sarah Connor is. She still retains a gentle nature and compassion for other people, but nor does she have the supposed vulnerability of most fairy-tale damsels. Belle is smart and tough, and accepts neither of her suitor’s oppressive demands. Belle’s rejection of Gaston, after he tells her that he’s looking to make her his “little wife” is “a huge slap in the face to the standard stereotype” (Wynn), and it sends the message that “women are ultimately in charge of their fate” and that “they do not have to submit to an overbearing male bent on ‘owning’ them” (Wynn). The fact that the film has presented this charming character as a “bad guy”, and casts an ugly monster as the “good guy”, goes utterly against the stereotype, replacing it instead with the message that “it’s not what a person has on the outside that matters, but what’s on the inside” (Wynn). The film’s title could just as easily refer to Gaston as the “Beast”, and the Beast as the “Beauty”, if we are looking at the souls of these characters. A darker reading of the film is that Belle and the Beast’s bond is actually an allegory for an abusive relationship. When the characters first meet it is in the form of a prisoner exchange. Belle sacrifices her freedom for her father’s, and thus submitting herself to his rule. The Beast spends much of his time ranting and raving, and treating Belle with about as much ire and distain as his servants. Then, all of a sudden, the love of the beautiful Belle transforms the Beast into a gentle, caring man. This might play into the illusion that the love of a good woman can turn an abuser into a good person. Even after escaping, Belle ends up returning to the castle, because she still believes that she can tame the savage Beast. Perhaps this reading is overly cynical, but it does send the message to young girls that they should persist through an abusive relationship, because if they are “good” or loving enough, he will change, quite literally, into a handsome prince (Caroll). On the other hand, the character of Gaston, could be read as something of a stalker, who has fabricated a real relationship with Belle, and becomes violent and threatening towards her when she shatters that fantasy. It is doubtful Disney ever intended these to be messages within the film, but twenty years later they do reveal something about gender politics of the era, and that despite the film’s evolved sense of gender equality, kernels of a more conservative masculine-feminine dynamic do remain. The films Terminator 2: Judgment Day and Beauty and the Beast represent two distinct representations of women, caught within a masculine power struggle. Sarah Connor strives towards a hyper masculinised self, embracing the technological horrors she once feared, before returning to a more empathetic, feminised personae. Belle is, by comparison, a symbol of feminine beauty and grace, but also embraces an independent and self-assured personae that is unique to fairy-tale settings. The men around them all represent a wide range of masculine visions, from the ruthless cyborgs assassins of Terminator 2, to the dashing, narcissistic Gaston, and brooding Beast from Beauty and the Beast. The archetypal male is satirised by Disney, while the snarling monster is shown to be the most worthy suitor; while the T-1000 portrays an entirely new vision of gender; a post-biological menace to humanity. The two films contain many different representations of men and women; no two the same.